London. London was believed – as a star and TV obsessed wee girl – to be chock full of celebrities. Be it on the Tube or loitering outside a theatre having a cigarette before their big show. Back then I’d listen with wide eyed awe as my uncle – an advertising executive – regaled tales of dining in restaurants with Michael Caine. Albeit sitting at a table nearby. So on my first trip Dann Saff, I eagerly scanned the crowds for the rich and famous. Only spotting Chris Serle (?) from That’s Life (1973-94) in the crowds. And no, it wasn’t like that intro from Closer (2004). Fast forward x years decades and my wee sister announced, she’d bought us tickets for London’s Spring Comic Con. I hoped my prized Patrick Duffy inspired T-shirt would be suitable geeky attire for this occasion. But my sister presented me with my blog themed T-shirt (front and back) which then I wore with modest pride. With matching t-shirts for her and her film buff pal who accompanied us. With an ever-growing list of celebrities attending I got almost as excited as the Dallas themed Wogan Now and Then Day in 2007, and mentioned HERE. Being in the same room as Patrick Duffy, Linda Gray and Larry Hagman, I was superexcited as a life long Dallas (1978-91) fan. The 2019 Comic Con list including appearances with everyone from John Simm to Peter Mayhue (Chewbacca), and Lucy Davis to some random Stormtroopers and a Jawa. The Stormtroopers and Jawa – my cynical self concluded – could have been represented by every one and any one of a certain height. But whats not to like? Admittedly I was there to see the better known stars, and not to buy the tacky and over priced memorabilia. So I’ll dwell on the former, rather than the latter. There are obviously loads of stalls where you can buy bobble head models of your favourite, T-shirts or plushies These apparently the ultimate keepsake. And will probably be a collector’s item one day. But only if you keep the packaging. There’s also Mystery Boxes, where you get a combination of these but don’t know what you are getting. With no doubt those hard to sell items added to the boxes. rather than best sellers. Other stalls were much more appealing with ones with film posters galore, and also with press packs, stills, lobby cards and soundtracks in staggering amounts (where do they get these from, answers please). Scanning the stills, pics and packs for a favourite film (or two). These fave movies, immediately hard to remember in my then overloaded film infused brain. There were so many, many good choices. I did curse silently for not keeping my old record player and having an unlimited bank overdraft (and more importantly room in my luggage). Then in a flash of inspired brilliance I thought of meeting a celebrity, as that’s what Comic Con is all about. Isn’t it? Clutching my hard-earned dosh, I then selected my victim choice. So who to meet? Most of the celebrities were out for lunch on our arrival. I dutifully waited like Leonardo in those Oscar ceremonies before The Revenant (2015). There was a queue a mile long for Tom Baker, so that was out of the question. Then I literally bumped into Eddie Marsen. Marsen said hello to me, I said hello back. Then it dawned on me.. just.. who .. this.. was. So apologies Eddie for this moment of vagueness. After much deliberation, I selected the actor of my choice. The one and only David Warner. This an actor I’ve considered at least once to tribute in a blogathon. And who I adored in The Omen (1976) – before his characters head was lopped off – but also remembered in Star Trek : The Undiscovered Country (1991), The Man with Two Brains (1983) and Titanic (1997). 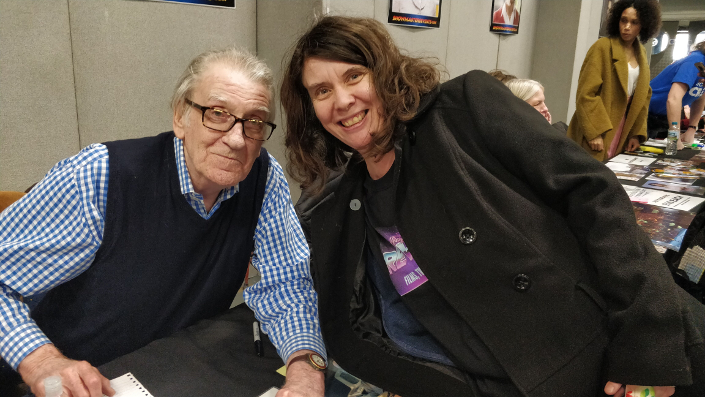 I’d harassed asked his minder on – quite professionally and politely – by asking when Mr Warner would make an appearance. Later on when I met him with my sister’s buddy (you know who you are), I got starstruck and tongue-tied. Instead of asking him an intelligent question on his roles in fluent Klingon or if Leonardo DiCaprio is as lovely as I hope he is, I asked him about The Man with Two Brains. Asking him if he got to keep a brain as a souvenir after filming. Duh! Apologies now, if you reading this Mr Warner. My star struck self however is still impressed with my London-based sister as she tells of her brushes with fame. These with the likes of Rob Brydon, Take That and Richard Harris. My uncle and his partner now telling of sights of the lovely Philip Glenister and John Hannah (in his speedos) at the gym. Cool! Sounds like you had a blast. David Warner is one of my perpetual favorites. He would be the perfect subject for a future blogathon. Sounds like a plan if you up for it! It was great fun, and lovely to meet this actor from such wonderful movies.